Kanchanaburi War Cemetery, Plot 10, Row B, Grave 15, Age 43. Selarang Camp Changi, Johore Bahru, Adam Park, Sime Road Camp, Selarang Barracks Changi. This NCO was highly respected and held the temporary rank of Lieutenant as a Prisoner of War. He had acted as the Commanding Officer of No. 7 Platoon when Lieutenant P. V. Dean was evacuated to hospital. He had held the rank of Lieutenant in the militia in which he served from 1924-1929. 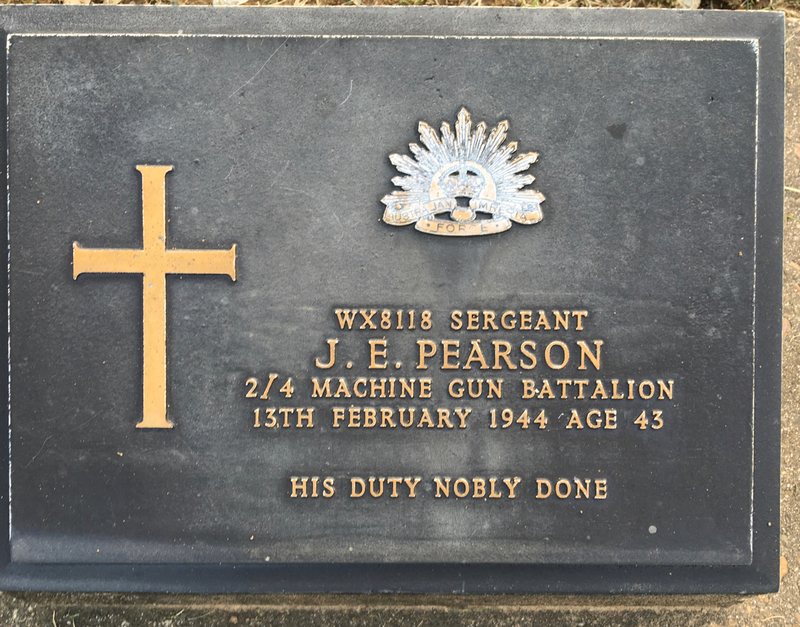 John and Donald Pearson were a former Scotch College students. He was selected from Selarang Barracks Singapore with ‘D’ Force S Battalion to work on the Burma-Thai Railway. ‘D’ Force departed Singapore by train in March 1943 headed for Hellfire Pass area. He became ill with beri-beri and enteritis and died at Chungkai on 13/2/1944. 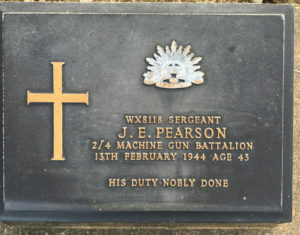 His younger brother Donald David Pearson WX13816 enlisted 3 June 1941 joining the 2/4th ‘B’ Coy – same company as John. Don Pearson was sent to Burma-Thai Railway with ‘H’ Force Group No. 3, working at Kanu II, Malayan Hamlet and Kanchanaburi Camps. Don was fortunate, he survived to return to his wife and family.